As the town starts to wind down from all the triathlon troopers, now is the best time to visit Byron Bay. It has the same things happening just without all the hustle and bustle. Come visit today to see the most easterly point in Australia, go for a surf or take a stroll on one of the top 10 beaches in the world, and a must do is to go to the markets. But there is so much more to do. There is way too much to fit into one day so why not stay for a couple of days to fit everything in. Better yet why not bring all your friends and have heaps of fun. We have big barbeques to cook your snags on and 50 meters away we have our own beach to play some beach cricket. We can cater for one person right up to large groups. This week we have our regular group of Marist College that come down to learn about the nature reserve trails and how to surf. 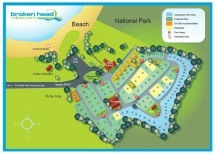 If you would like to have a get together with all your friends and family why not come to Broken Head Holiday Park today. For group bookings please call our office on our free call number 1800450036 to reserve a group of sites.